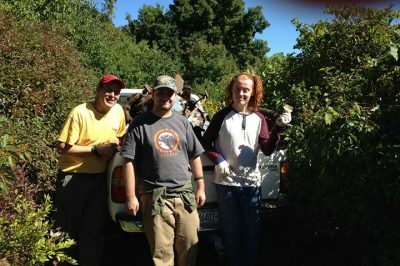 A few years ago, a teenager from EcoVillage Ithaca (EVI) noticed that a lot of litter marred the beautiful EVI land beyond our homes, detritus left behind in the fields and forests by the acreages’ previous owners. The biggest examples were two whole wrecked cars. This young man thought that the litter was not pleasant to look at, nor healthy for the environment, so he decided to do something about it. 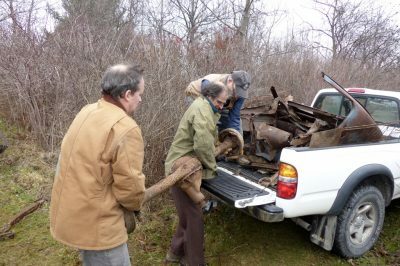 With the aid of his father, he put out a call for volunteers on the EcoVillage Listserv, obtained some willing workers, and cut up these cars into pieces. 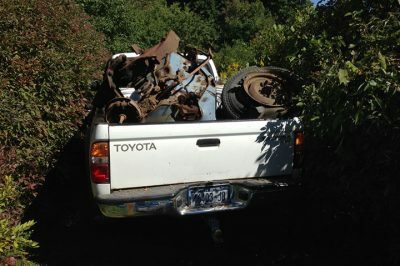 Gradually, as the teams cut up the two cars, he and his dad transported the scrap metal down to a local scrap yard in a pickup truck generously lent to them by their neighbor, to get the metal recycled for money. 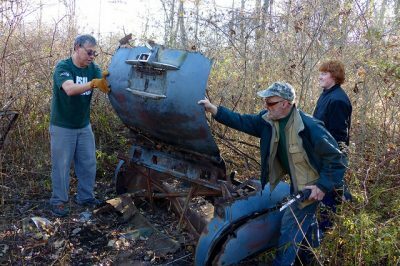 He was initially concerned that breaking up the cars and hauling them to a local recycler would require tools to which he did not have access; however, he was relieved to find that even for the toughest car-removal project, namely the removal of the chassis and engine block of a 1956 Plymouth, an electric hacksaw and a refrigerator dolly were sufficient. Additionally, the village provided a small tractor to help lift the engine block into the pickup truck. But getting to this stage of the removal process for the two car wrecks, as well as the overall litter removal operation at EcoVillage, did not happen overnight; it required five work parties over the course of nearly two years, from the morning when a whole 1960s Volkswagen wreck was removed, to when the final parts of the 1956 Plymouth were removed. 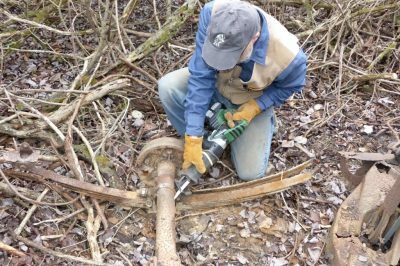 It took 10 months just to remove the Plymouth wreck, given the nature of the car, how degraded it was, and most of all the environment in which it was dumped, a forbidding tangle of trees, shrubs, and vines. 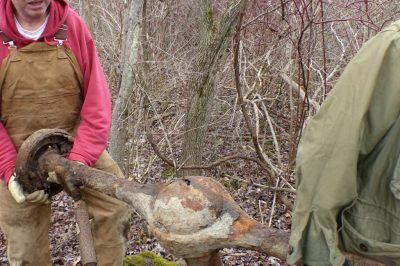 Led by this young man, teams of EcoVillagers whacked their way into the brush, working together to clear the rusted carcasses, bit by bit. Despite the challenges, the work parties succeeded. On a Sunday this September, the Plymouth chassis—and perhaps most impressively, the engine block—were taken to the local scrap metal dealer for cash. Most of this money was then used to fund the planting of native saplings on the land. The teenager, now a young adult and a budding environmentalist, is very pleased with the results, but he sees that still more could be done. He envisions future work parties—more opportunities for our cohousing neighbors to have fun working together, cleaning up and restoring the land.